Getz was born Stanley Gayetski on February 2, 1927, at St. Vincent's Hospital in Philadelphia. His grandparents Harris and Beckie Gayetski were from the Kiev area of Ukraine but migrated to Whitechapel, in the East End of London, and owned the Harris Tailor Shop at 52 Oxford Street for more than 13 years. In 1913, Harris and Beckie emigrated to the United States with their three sons Al, Phil, and Ben after their son Louis Gayetski in 1912. Getz's father Al was born in Mile End, London, England in 1904 and his mother Goldie Yampolsky in Philadelphia in 1907. The Getz family first settled in Philadelphia, but during the Depression the family moved to New York City, seeking better employment opportunities. Getz worked hard in school, receiving straight As, and finished sixth grade close to the top of his class. 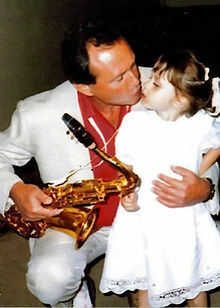 Getz's major interest was in musical instruments and he played a number of them before his father bought him his first saxophone at the age of 13. Even though his father also got him a clarinet, Getz instantly fell in love with the saxophone and began practicing eight hours a day. He attended James Monroe High School in the Bronx. In 1941, he was accepted into the All City High School Orchestra of New York City. This gave him a chance to receive private, free tutoring from the New York Philharmonic's Simon Kovar, a bassoon player. He also continued playing the saxophone. He eventually dropped out of school in order to pursue his musical career, but was later sent back to the classroom by the school system's truancy officers. In 1943, at the age of 16, he was accepted into Jack Teagarden's band, and because of his youth he became Teagarden's ward. Getz also played along with Nat King Cole and Lionel Hampton. After playing for Stan Kenton, Jimmy Dorsey, and Benny Goodman, Getz was a soloist with Woody Herman from 1947 to 1949 in "The Second Herd", and he first gained wide attention as one of the band's saxophonists, who were known collectively as "The Four Brothers", the others being Serge Chaloff, Zoot Sims and Herbie Steward. With Herman, he had a hit with "Early Autumn" and after Getz left "The Second Herd" he was able to launch his solo career. He was the leader on almost all of his recording sessions after 1950. Getz's reputation was greatly enhanced by his featured performance on Johnny Smith's 1952 album Moonlight in Vermont, that year's top jazz album. The single of the title tune became a hit that stayed on the charts for months. In the mid to late 1950s working from Scandinavia, Getz became popular playing cool jazz with Horace Silver, Johnny Smith, Oscar Peterson, and many others. His first two quintets were notable for their personnel, including Charlie Parker's rhythm section of drummer Roy Haynes, pianist Al Haig and bassist Tommy Potter. A 1953 line-up of the Dizzy Gillespie/Stan Getz Sextet featured Gillespie, Getz, Peterson, Herb Ellis, Ray Brown and Max Roach. Returning to the U.S. from Europe in 1961, Getz became a central figure in introducing bossa nova music to the American audience. Teaming with guitarist Charlie Byrd, who had just returned from a U.S. State Department tour of Brazil, Getz recorded Jazz Samba in 1962 and it quickly became a hit. Getz won the Grammy for Best Jazz Performance of 1963 for "Desafinado", from the same album. It sold over one million copies, and was awarded a gold disc. His second bossa nova album, also recorded in 1962, was Big Band Bossa Nova with composer and arranger Gary McFarland. As a follow-up, Getz recorded the album, Jazz Samba Encore!, with one of the originators of bossa nova, Brazilian guitarist Luiz Bonfá. It also sold more than a million copies by 1964, giving Getz his second gold disc. He then recorded the album Getz/Gilberto, in 1963, with Antônio Carlos Jobim, João Gilberto and his wife, Astrud Gilberto. Their "The Girl from Ipanema" won a Grammy Award. The piece became one of the most well-known Latin jazz tracks. Getz/Gilberto won two Grammys (Best Album and Best Single). A live album, Getz/Gilberto Vol. 2, followed, as did Getz Au Go Go (1964), a live recording at the Cafe au Go Go. Getz's love affair with Astrud Gilberto brought an end to his musical partnership with her and her husband, and he began to move away from bossa nova and back to cool jazz. While still working with the Gilbertos, he recorded the jazz album Nobody Else but Me (1964), with a new quartet including vibraphonist Gary Burton, but Verve Records, wishing to continue building the Getz brand with bossa nova, refused to release it. It came out 30 years later, after Getz had died. In 1972, Getz recorded in the fusion idiom with Chick Corea, Tony Williams and Stanley Clarke, and in this period experimented with an Echoplex on his saxophone. He had a cameo in the film The Exterminator (1980). In the mid-1980s Getz worked regularly in the San Francisco Bay area and taught at Stanford University as an artist-in-residence at the Stanford Jazz Workshop until 1988. In 1986, he was inducted into the Down Beat Jazz Hall of Fame. During 1988, Getz worked with Huey Lewis and the News on their Small World album. He played the extended solo on part 2 of the title track, which became a minor hit single. His tenor saxophone of choice was the Selmer Mark VI. Getz married Beverly Byrne, a vocalist with the Gene Krupa band, on November 7, 1946 in Los Angeles; they had three children together, Steve, David and Beverly. As a teenager, Getz had become involved with drugs and alcohol. In 1954, he was arrested for attempting to rob a pharmacy for morphine. As he was being processed in the prison ward of Los Angeles County-USC Medical Center, Beverly gave birth to their third child one floor below. Getz was divorced from Byrne in Nevada on November 3, 1956, after which he married Monica Silfverskiöld, daughter of Swedish physician and former Olympic medalist Nils Silfverskiöld. They had two children, Pamela and Nicolaus. The couple lived in Copenhagen, Denmark, partly to escape Getz's legal problems. In 1964, Getz traveled to Brazil to work with João Gilberto, famed creator of bossa nova. While recording the influential album Getz/Gilberto, Gilberto introduced Getz to his wife, Astrud Gilberto, who sang two of the tracks on the album. After the album was recorded, Getz returned to the United States, and Astrud Gilberto went with him, divorcing João Gilberto. Getz and Astrud Gilberto maintained a personal and musical relationship for many years, though they never married, possibly because Getz was unable to obtain a divorce. Getz filed for divorce from Monica Getz in 1981, but the petition was not granted until 1987. Monica Getz asserted in divorce court that her husband had been abusive towards his children and occasionally towards her. In 1990, Monica Getz petitioned the United States Supreme Court to have their divorce verdict overturned on the grounds that the New York law requiring settlement agreements to be heard in trial court instead of family court discriminated against women who, like her, could be bankrupted by paying trial lawyers. The Supreme Court declined to hear the case. Zoot Sims, who had known Getz since their time with Herman, once described him as "a nice bunch of guys", alluding to the wide range of his personality. Getz died of liver cancer on June 6, 1991. His ashes were poured from his saxophone case six miles off the coast of Marina del Rey, California, by his grandson, Chris. In 1998, the Stan Getz Media Center and Library at Berklee College of Music was dedicated through a donation from the Herb Alpert Foundation. ^ a b c Yanow, Scott. "Stan Getz". AllMusic. Retrieved November 23, 2014. ^ Eric Schneider (March 11, 1952). "Moonlight in Vermont - Johnny Smith, Johnny Smith Quintet | Songs, Reviews, Credits, Awards". AllMusic. Retrieved August 18, 2015. ^ a b Murrells, Joseph (1978). The Book of Golden Discs (2nd ed.). London: Barrie and Jenkins Ltd. pp. 146–147. ISBN 0-214-20512-6. ^ "Stan Getz". NNDb.com. Retrieved August 18, 2015. ^ "Monica Getz". Lund University Foundation. Lund University Foundation. Retrieved March 24, 2015. ^ a b c Margolick, David (November 26, 1990). "Ex-Wife of Stan Getz Testing a Divorce Law". New York Times. Retrieved March 24, 2015. ^ a b Watrous, Peter (June 7, 1991). "Stan Getz, 64, Saxophonist, Dies; A Melodist With His Own Sound". New York Times. Retrieved March 24, 2015. ^ a b Inc, Nielsen Business Media (February 5, 2000). Billboard. Nielsen Business Media, Inc.
^ "7th Annual GRAMMY Awards". GRAMMY.com. January 17, 2013. Retrieved April 29, 2017. ^ Jazz, All About. "Stan Getz: Spring 1976". All About Jazz. Retrieved April 29, 2017. ^ "Stan Getz | Awards". AllMusic. Retrieved April 29, 2017.